Wedding flower design and arrangement is a service provided by The Florabella Florist. Weddings in the Philippines are a well celebrated event, the flower design, arrangement and delivery for a wedding in the Philippines is thus a meticulous and sophisticated task reserved only to those who are very creative and artistic yet at the same time strong with time and people management skills to ensure the timely delivery of all flowers and decorations needed for the wedding. 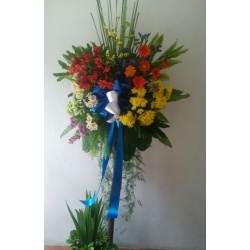 From church flower setting to wedding flower centerpiece to bridal flower bouquet and entourage bouquet, The Florabella Florist can handle all wedding flower arrangement requirements in the Philippines. 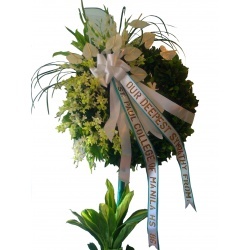 Take a look at some of our Wedding Arrangement service items. Prices are rated at $0.00 because actual price depends on the complexity, type of flowers, amount of flowers and design requirements of the wedding. Contact us for a consultation about wedding flower arrangement services.